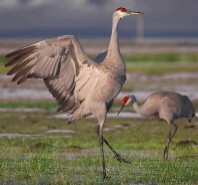 Can Sandhill Cranes Predict Weather? On Feb 5, 2012, we saw sandhill cranes migrating north. That is very early to be headed north compared to our sightings over the last few years. Normally, they wait until March. We saw them migrating south around Jan 1, 2012. That was about a month later than usual. The winter here has been very warm in February and March (as of March 15). Here, on March 15 in the Atlanta area, it is sunny and 81 degrees. How did the sandhill cranes know it was going to be a mild, short winter? I was working outside putting a deer fence around our garden on the weekends of Nov 15 and 22. Occasionally I heard the wonderful sound of sandhill cranes chortling as they migrate south. I took several videos of the flocks but they were so high that you can't see much (given the limited zoom of my Flip camcorder). Nonetheless, here's a video of the sandhill crane flocks passing over. For the last three weeks, flocks of sandhill cranes have been passing over our neighborhood on their annual passage to the North. I feel fortunate to work from home, so I can run outside and enjoy the sight and sounds of these beautiful birds as they pass over. Click on the link below to watch the slideshow picturing a sandhill crane family. John Michael Greer describes cultural migrations and the reasons they occur, from a big picture, historical perspective. Excerpts below. German historians of the 19th century coined a useful word for the age of migrations that followed the fall of Rome: Völkerwanderung, “the wandering of peoples.” Drawn by the vacuum left by the implosion of Roman power, and pushed by peoples from the steppes further east driven westward by climate change, whole nations packed their belongings and took to the road. The same thing has happened many other times in the past, though not always on the same vast scale. What makes it important for our present discussion is that we are likely to see a repeat of the phenomenon on an even larger scale in the fairly near future. The first ripples of this future flood can be seen by anyone who travels by bus through any rural region west of the Mississippi River, as I did a few days ago. Stray very far from the freeways and the tourist towns, and in a great many places you’ll discover that culturally speaking, you’re in Mexico, not the United States. The billboards and window signs are in Spanish, advertising Mexican products, music, and sports teams, and the people on the streets speak Spanish and wear Mexican fashions. It’s popular among Anglophone Americans to think of this sort of thing as purely a phenomenon of the Southwest, but the bus trip I’ve mentioned was in northwestern Oregon. There are some 30 million people of Mexican descent in the US legally, and some very large number – no one seems to agree on what the number is, but 8 million is the lowest figure I’ve heard anyone talking about – who are here illegally. As the migration continues, a very large portion of what is now the United States is becoming something else. There’s been a great deal of angry rhetoric from all sides of the current debate about immigration from Mexico, of course, but very little of it deals with one of the primary driving forces behind it – the failure of the American settlement of the West. The strategies that changed the eastern third of the country from frontier to the heartland of the United States didn’t work anything like as well west of the Mississippi. Today the cities, towns, and farms that once spread across the Great Plains in an unbroken carpet are falling apart as their economic basis crumbles and their residents move away, while most of the mountain and basin regions further west survive on tourist dollars, retirement income, or specialized cash crops for distant markets – none of them viable economic bases once cheap energy becomes a thing of the past. Like the Mongol conquest of Russia or the Arab conquest of Spain, the American conquest of the West is proving to be a temporary phenomenon, and as the wave of American settlement recedes, the vacuum is being filled by the nearest society with the population and cultural vitality to take its place. This isn’t an issue unique to America. The same thing is happening right now in Siberia, where Chinese immigrants are streaming across a long and inadequately guarded border and making the Russian settlement of northern Asia look more and more like a passing historical phase. It’s a very common phenomenon when the reach of a powerful nation turns out to exceed its grasp. In a showdown between military power and demography, demography generally wins. We saw and heard flocks of sandhill cranes headed north on Feb 23 – 28. Hope they avoid the storms and bad weather that can endanger flying critters. Below are some links to my previous posts about sandhill cranes. Apparently we saw them migrating in late Feb 2005 also.